Whatever happened to British protest? For a nation that brought the world Chartism, the Suffragettes, the Tolpuddle Martyrs, and so many other grassroots social movements, Britain rarely celebrates its long, great tradition of people power. 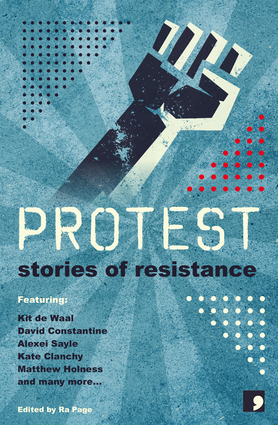 In this timely and evocative collection, twenty authors have assembled to re-imagine key moments of British protest, from the Peasants' Revolt of 1381 to the anti-Iraq War demo of 2003. Written in close consultation with historians, sociologists and eyewitnesses – who also contribute afterwords – these stories follow fictional characters caught up in real-life struggles, offering a streetlevel perspective on the noble art of resistance. In the age of fake news and post-truth politics this book fights fiction with (well researched, historically accurate) fiction. Sandra Alland is an Edinburgh-based Scottish-Canadian writer, interdisciplinary artist, small press publisher, performer, filmmaker and curator. Martyn Bedford is a British author. He is an alumnus of the University of East Anglia. Sean Cernow is an actor and poet. Kate Clanchy was educated in Edinburgh and Oxford University. She lives in Oxfordshire where she now works as a teacher, journalist and freelance writer. Born in Salford in 1944, David Constantine worked for thirty years as a university teacher of German language and literature. Frank Cottrell-Boyce is a British screenwriter, novelist and occasional actor, known for his children's fiction and for his collaborations with film director Michael Winterbottom. Mandy Theresa O'Loughlin, known professionally as Kit de Waal, is an English writer. Stuart Evers is the author of Ten Stories About Smoking, which won The London Book Award. Sarah Maitland is a British writer and feminist. An accomplished novelist, she is also known for her short stories. Joanna Quinn is studying for a PhD in Creative Writing at Goldsmiths, University of London. Francesca Rhydderch's debut novel, The Rice Paper Diaries, was longlisted for the Authors' Club Best First Novel Award and won the Wales Book of the Year Fiction Prize 2014. Jacob Ross is a novelist, short story wiriter, editor and creative writing tutor.